This book will help instructional leadership increase the collaborative learning of its teacher teams through a framework of collaborative coaching methods. 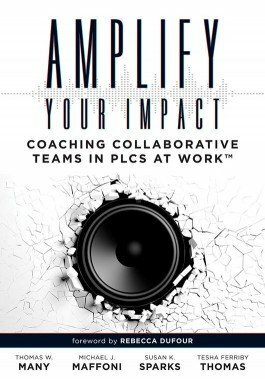 Amplify Your Impact presents K–12 educators and school leadership with a framework for improving collaboration and teambuilding for teachers in their PLCs. The authors share best practices and processes teams can rely on to ensure they are doing the right work in a cycle of continuous improvement. Discover concrete action steps your school can take to adopt proven collaborative coaching methods, fortify teacher teams, and ultimately improve student learning in classrooms. Gain insights from teachers and empirical evidence from schools that confirm the benefits of how coaching and refining collaborative teams can strengthen PLCs. Use the Pathways Tool for Coaching Collaborative Teams to guide your team’s conversations and team-based learning. Learn how to develop and use the strategy implementation guide (SIG) to map out your collaborative team success. Analyze coaching scenarios that illustrate how to turn ineffective team meetings into positive collaborative learning experiences. Increase instructional leadership development that promotes reflective coaching and a collaborative approach.